Brodie’s Mill, built in 1790, was the oldest custom-built woollen textile mill in the Scottish Borders. This formed the nucleus of the later expanded Caerlee Mill, which remained in continuous production until the last holding company was forced into liquidation in 2013. The original factory was equipped to turn fleeces from Borders sheep into woven cloth and garments and was modernised on several occasions during the 19th century, water power giving way to steam in the 1840s. Change continued in the 20th century when Caerlee Mill became a “hosiery”, producing high quality knitwear using fine cashmere yarn. This led to a flourishing export trade in the 1960s and 1970s when the mill was run by the award winning Ballantyne Sportswear. The five storey Brodie building is listed but nearly all the other redundant factory premises now await demolition to make way for houses, a fate which has already befallen the town’s other mills. When it was constructed the original five-floor block of Caerlee Mill was one of the earliest industrial textile units of its type in the Scottish Borders. It was built between 1788 and 1790 at the behest of Traquair-born Alexander Brodie for £3,000 to manufacture woollen cloth. He hoped it would provide a good living for local people and bring the benefits of the industrialisation to Innerleithen and Traquair. According to the First Statistical Account, from 27 to 80 hands were employed within doors, with at least as many outwith the factory (probably weaving on hand looms or finishing). Children from seven years of age performed teasing and carding operations for 2s 6d (12½p) per week. Adult spinners and weavers could earn 18s (80p) per week. In its first year of operations the mill produced £1,200 worth of cloth. To begin with the enterprise was not a commercial success. This was due mainly to inexperienced management and a lack of skilled hands used to working in factory conditions. Brodie, who had made his fortune supplying stoves to the British navy and who was based in London, left his nieces and nephews in charge of the mill, which they inherited after his death in 1811. The factory was rented out to David Ballantyne in the 1820s and here his 18 year old son, Henry, started his first weaving business. In the 1830s the Dow brothers manufactured tartan material and fancy shawls for the Glasgow market but this venture ultimately failed. When the Second Statistical Account was compiled in 1834, 50 people were employed in the mill. Working a 10 hour day weavers now earned only 14s (70p) per week; slubbers also 14s per week; piecers 3s (15p) and shawl-plaiters 4s (20p). The mill remained the property of Brodie’s estate until 1839 when it was sold to the Galashiels company Messrs Gill & Sime. 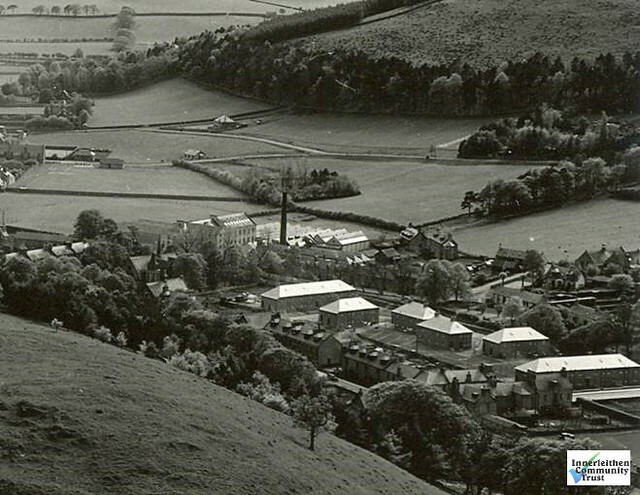 Robert Gill, a knowledgeable and innovative textiles manufacturer, took over, modernized and enlarged Caerlee Mill, adding steam-power to that provided by the water-wheel. By the 1860s the mill contained 6 sets of carding machines, 30 power and 20 hand looms, 4,200 spindles and employed over 100 people. Exclusively Australian or foreign wool was used to make tweeds, tartans and flannel shirtings. Caerlee Mill was sold in 1868 to J.W.Walker & Co. and in 1886 to John, James and Henry Ballantyne, sons of Henry Ballantyne of Walkerburn, later becoming part of D. Ballantyne & Co. of March Street Mills, Peebles. In 1919, it was amalgamated along with Waverley Mills and March Street Mills under D. Ballantyne Brothers & Co.
John A. Anderson worked in Caerlee Mill in the 1880s as a boy and fifty years later he recorded his memories in his “Cleikum” column for the Peeblesshire News. The “mill wheels whirled” ceaselessly from 6am to 9pm Mondays to Fridays and from 6am to 2pm on Saturdays, still and silent on Sundays only. Employees were summoned to work by a mill bell and the flats were lit by gaslight during the hours of darkness. There were no canteen facilities or rest rooms and it was the duty of boys to take cans of tea to the workers during their half-hour break. JAA started worked as a piecer at the age of 12½ years and by the time he was thirteen he was putting in 12 hour shifts daily. Working a five and a half day week he earned 6s (30p). Weekday overtime from 6pm to 9pm was paid at 9d (under 4p) per evening. From a selection of woollen mill trades listed in the 1881 Census some examples are birler, picker, scourer, teaser, twister, drawer’s ingiver, hosiery mounter, mule piecer, pattern weaver and warp winder. After the First World War, Caerlee Mill switched over to the production of knitted hosiery goods using fine cashmere wool. Over time, Ballantyne Sportswear, later Ballantyne Cashmere, came to rival factories in Hawick in the production of a whole range of cashmere and intricate intarsia garments, gaining a worldwide reputation for quality and awards for enterprise. The Ballantyne company also had responsibility for the maintenance of the mill lade or the “Dam” (from which we get Damside). Although water-wheels had not been used to drive the machinery for many years the dam still provided a regular and convenient source of soft water to wash the cashmere and give it a fabulously soft texture. Today we find Caerlee Mill in its dying throes. A company called Caerlee Mills Ltd – even the Ballantyne name has gone – with a mere 40 employees still produced excellent quality cashmere goods until early 2013. The factory will follow the path of the other great Innerleithen textile mills and be part converted, part demolished and replaced with housing.